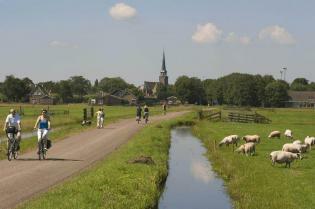 Holland-Cycling.com is an internet guide to cycling in Holland. We do not organise cycling holidays ourselves. To help you on your way, we made a selection of the most popular cycling holidays offered by Dutch tour operators. The information on this page is provided by the tour operator. 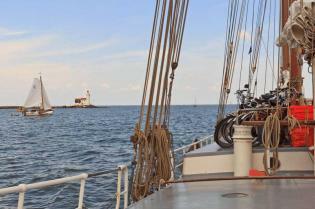 Sail & Bike along the coast of the IJsselmeer. Once a salty sea, now the largest sweet water lake in all of Holland! Discover this unique part of the Netherlands aboard a magnificent and comfortably furnished sailing ship, and while riding excellent cycle paths and tracks. Sailing experience is not necessary. Just a desire to give it a go. Cycling can be done on your own or by joining a tour leader. Whatever you like best. Up until 1932, the IJsselmeer was an inland sea called the Zuiderzee. Since the Middle Ages, the area played a major role in the economic development of the Netherlands, but was also often severely flooded. A 32-kilometer long dike, finished in 1932, put an end to the flooding and turned the salty sea into a sweetwater lake. Along its banks many picturesque, historical harbour and trading towns, centuries-old polders (fields of reclaimed land below sea level) and beautiful inland villages are still witness to a rich seafaring past. The IJsselmeer’s now sweet water is home to a huge diversity of birds, plants and fish. 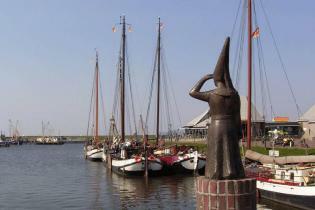 You will visit many of those historical towns and polders on both the western and eastern banks of the IJsselmeer. The tour also leads you through various Dutch national parks and gets you as far as the province of Overijssel. On the final day the ship sails back to Amsterdam, while you can relax on board. We do stop for a last short bike ride though: through the Oostvaardersplassen—a nature reserve known for its rewilding, meaning that the area is left alone to create its own natural balance of animal and plant life. The impressive clipper Elizabeth was built in 1913 and boasts a plush interior design. During the painstaking renovation to become a modern passenger sailing vessel great attention was paid to retaining the original features of the characteristic Dutch flat bottom boat. Roomy cabins with en-suite shower and lavatory, a large salon with bar and a snug seating area ensure your stay will be comfortable. The vessel has a total of 10 guest cabins with two single beds. Some of the cabins can be booked as a three-bed or four-bed cabin (the third and fourth beds as bunks). Eight cabins are located on the lower deck, two cabins on the upper deck. You can open a window or porthole in all the cabins. All cabins have a 220-volt socket. The Elizabeth is 41 meters long, 7 meters wide and has a sail surface of 445 m². The information on this page has been provided by the tour operator. Please check the tour operator's website for the most up-to-date information. Is this not the holiday you're looking for? The Amsterdam – Bruges bike and barge cycle tour is an exciting and diverse holiday experience that highlights some of the most beautiful cities of Holland and Belgium. You can start this tour either in Amsterdam or Bruges. 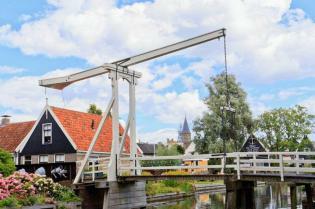 Discover the best of what the beautiful Provinces of North Holland and Friesland offer. Highlights are Amsterdam, museum village Zaanse Schans, Alkmaar, the old harbour towns of Medemblik, Enkhuizen, Hoorn and Volendam. Perfect tour for anyone wanting to see as much of “typical” central Holland as is possible in one week. Highlights include the beautiful cities of Amsterdam, Utrecht, Rotterdam, Delft and Haarlem. We'd love to hear what you have to say. Please leave a message in our guest book.